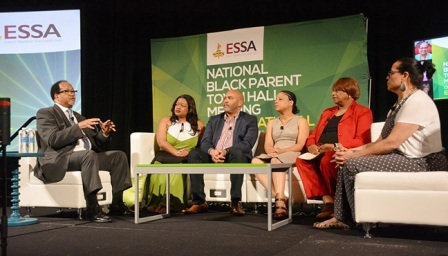 In an on-going effort to increase awareness about the “Every Student Succeeds Act” (ESSA) in the Black community, the National Newspaper Publishers Association (NNPA) hosted a national town hall for Black parents at the National Harbor in Prince George’s County, Md. As the fall school year rapidly approaches, education advocates, community stakeholders and civil rights groups have expressed concerns about the implementation of ESSA, President Obama’s landmark education law that reauthorized the Elementary and Secondary Education Act of 1965. The NNPA, a trade group representing over 200 Black-owned media companies, received a grant from the Bill and Melinda Gates Foundation to engage the Black community about ESSA. Dr. Benjamin F. Chavis, Jr., the president and CEO of the NNPA, and Dr. Elizabeth Primas, the program manager for the NNPA’s ESSA Media Campaign, co-moderated the event. Chavis thanked the Bill and Melinda Gates Foundation for enabling the NNPA to raise public awareness about ESSA and to focus on Black parents. Community activist and radio personality DJ EZ Street emceed a lively reception before the town hall, giving the participants an opportunity to interact with panelists, civic leaders and NNPA members. “There are a lot of organizations that have organized teachers, there are a lot of organizations that have organized [school] administrators, but the group that isn’t well-organized is parents, particularly Black parents,” said Chavis, adding that ESSA can only bridge the academic achievement gap, if parents get involved and engaged. According to the National Center for Education Statistics, 81 percent of White students in grade 12 scored higher than the average Black student in the same grade. “Most of us have never heard of ESSA, that’s reality, but we’re going to change that reality over the next couple of years,” said Chavis. Lynn Jennings, the director of national and state partnerships of Education Trust, saidthat parents need to know what’s in the law in order to use the law, because it’s a tool. Jennings noted that community investment and community stakeholders are a big part of ESSA. Marietta English, the president of National Alliance of Black School Educators, challenged the cultural competency of the some of the tests that are administered in our nation’s public schools. She noted that, for children who grow up in the inner city, check-cashing depots might be a more familiar financial institution than conventional banks; questions about saving and financial transactions might not take that experience into account. “We’re not testing the knowledge of our children, we’re testing the knowledge of other children,” said English. Jennings said that the testing issue is real, and it has been an area of deep concern for a long time. Teia Hill, the president and CEO of Fightin4Lives, LLC, saidthat Black parents need to do a better job of speaking up about the issues that are relevant to the community. Stewart lamented that the deck is often stacked against Black parents in a lot of ways, especially when it comes to ensuring equitable education for their children. The number of counselors in schools to help students figure out what the next step is has declined, Stewart noted.